The bike messengers are lucky enough to make one of his passions, bike, or your tool. 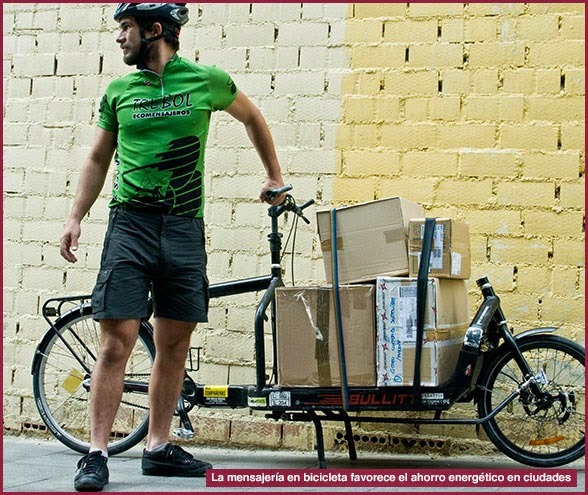 In this blog we talk WORLD alternative to motorized couriers who keeps fit the worker and contributes to improving the health of cities. For fans of any sport there is no better option than getting up every morning to earn a living practicing sport they love; well, this is the case of bicycle messengers, a profession that today we address the blog world. The bicycle messenger is a work that has been doing since there bike. Today it is a normal activity and recognized in Europe, USA, China, Chile, Mexico and many other places. The services provided consist of documents and goods transported from one place to another and always cycling either track or road freight. The existence of this type of alternative services for messaging motorized favors the environment and energy savings in cities and helps create awareness of healthy habits. 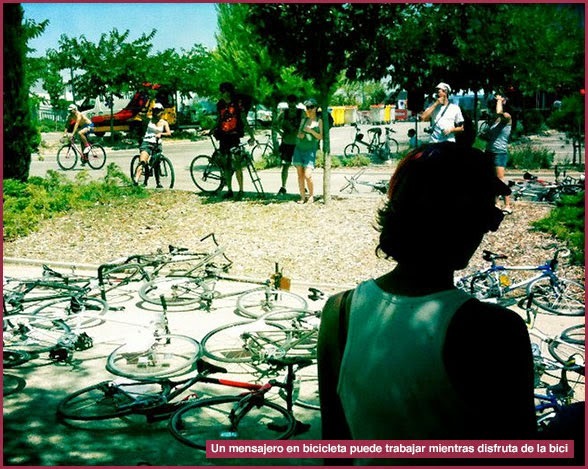 No matter if the city is flat or mountainous; if it rains, snows or make a heat death, bike messengers know they have to work every day, and do not care, work training, to enjoy. One of the curiosities of this guild is that usually people think that it is very strong, but in reality it is not. Most couriers are normal people who eat everything and lead a normal life but they have developed a high level of resistance to physical activity and a great ability to always find the shortest path from one place to another. 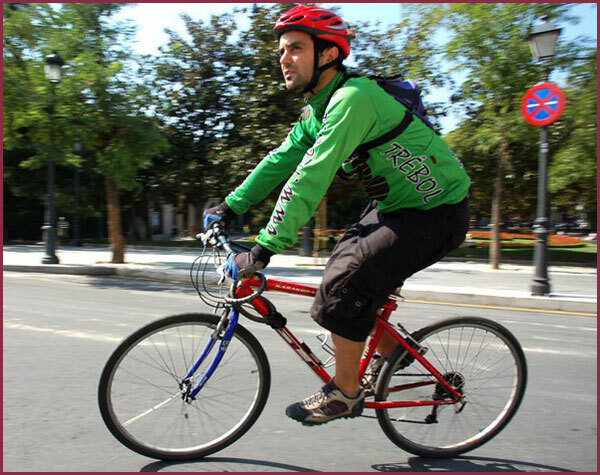 In Spain there are bike messenger in several cities such as Barcelona (Barcelona Clover), Madrid (Madrid Clover), Gijón (Moon), Pamplona (Orantxe) and many more. Like any profession, messengers also gather to celebrate and share experiences and compete to see who is the best of all. 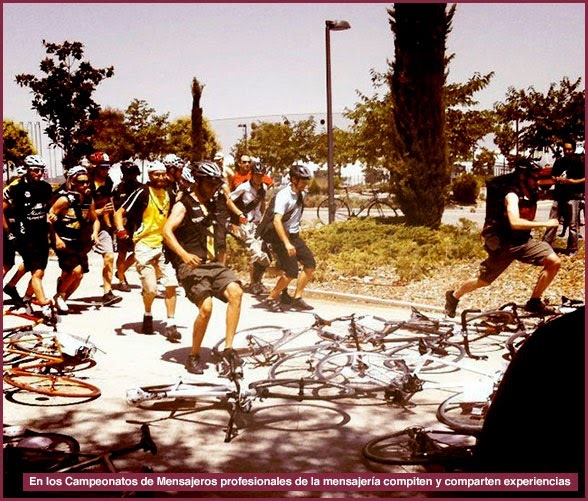 Currently annually held multiple championships messengers, being remarkable European Championship of Bike Messengers (held three times Gijon in Spain, Barcelona and Madrid) and the World Championship Bike Messengers. 2015 appointments will be Milan, the European Championship of Bike Messengers and Hake (Australia) with World Championship Bike Messengers. We are confident that both events are mainly found joy and celebration by these people work is his hobby.